This page includes some of our unusual aliens such as the fish face alien and a green alien making the universal sign for "call me". Also, several animated aliens having a great big belly laugh. I think they just said to a farmer, "take me to your leader". An alien pugilist on a black background. A very happy space alien animated. Animation has a transparent background. Purple alien designed for light and white web pages. He may be a distant relative of Frankenstein. Space alien having a great day floating down the Ichetucknee River. 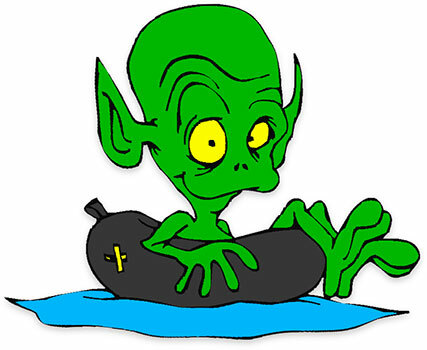 Green alien fighter on white background. Alien with an active sharp tail animation. Fish face alien with attitude. Green alien with purple eyes and something to say. 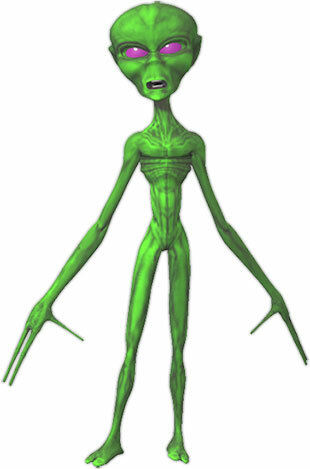 Green and purple alien on the move with a transparent background for any web page. Purple alien with a happy smile and a transparent background. 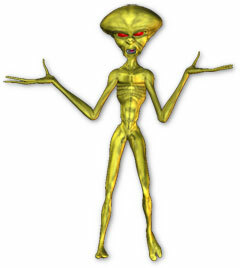 You may use our science fiction clipart, outer space graphics and animated aliens to enhance your web site including non profit personal and educational pages. You may simply copy and paste the small snippet of html below into your credits page. Thank you.